The reaction of 2-halobenzyl halides with the borate anion Li[(Ph)(t-Bu)Bpin] leads not only to the expected arylation at the benzyl position, but also to some Suzuki biaryl cross-coupling. 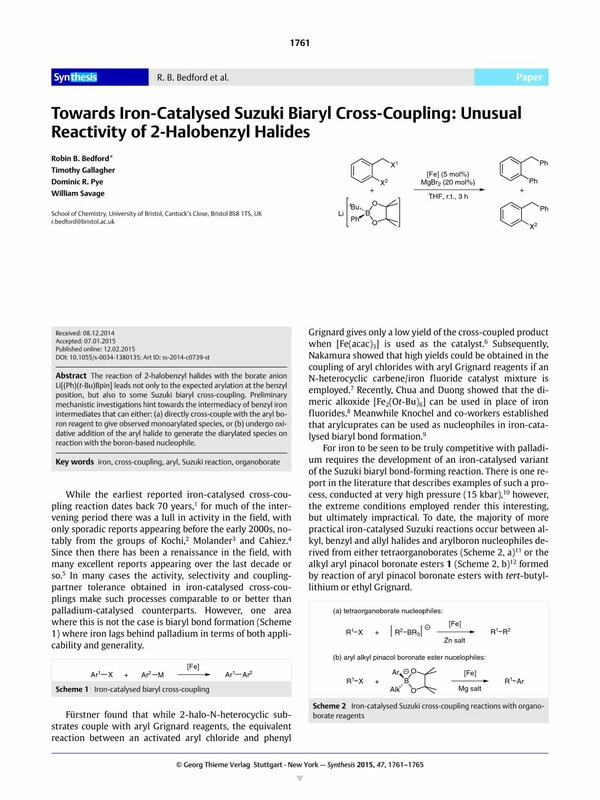 Preliminary mechanistic investigations hint towards the intermediacy of benzyl iron intermediates that can either: (a) directly cross-couple with the aryl boron reagent to give observed monoarylated species, or (b) undergo oxidative addition of the aryl halide to generate the diarylated species on reaction with the boron-based nucleophile. 5c Bedford, R. B.; Brenner, P. B. Top Organomet. Chem., Springer: Berlin, in press.